The Centurion Lounge offers some of the most diverse airport lounge benefits of any credit card issuer through its flagship Platinum Card®. A complimentary membership to Priority Pass™ Select opens the door at over 600 clubs worldwide, and you can also flash your Platinum Card to gain access to other lounges operated by Airspace and Delta Air Lines. But not everyone knows that American Express operates its own airport lounges and is expanding that network within the U.S. 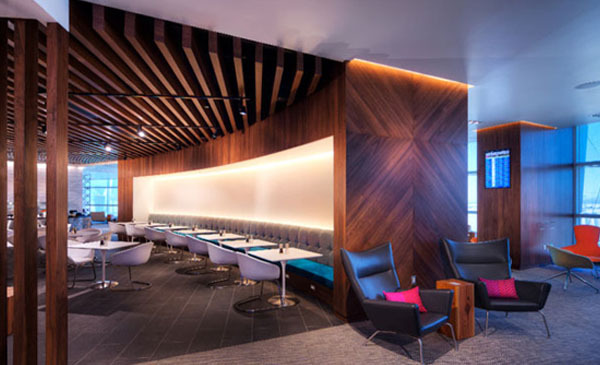 The most recent attention has been given to the American Express Centurion Lounges, beginning with Las Vegas (Concourse D, served by United Airlines) and Dallas/Fort Worth (Terminal D, served by American Airlines and international departures). 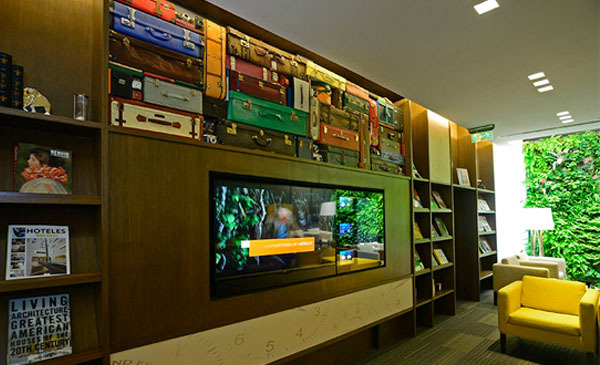 Both lounges are located airside and can be accessed from other terminals via inter-terminal trains or walkways. The Centurion Lounges at Dallas and Las Vegas are complimentary for guests with a Platinum Card or Centurion Card from American Express. A new Centurion Lounge is also opening at San Francisco (Concourse F, served by United Airlines) this summer. SFO’s inter-terminal train is located groundside and requires passengers to clear security again when moving between terminals. However, there an airside corridor connects Concourse F to some international departures in Concourse G. A fourth lounge at New York-LaGuardia does not yet have an opening date, but it will be located before security due to the absence of easy connections between gates. Remember, passengers with a valid ticket may usually access other areas of the airport even if their flight uses a different terminal. Just be sure to leave time to exit and re-clear security before your departure! 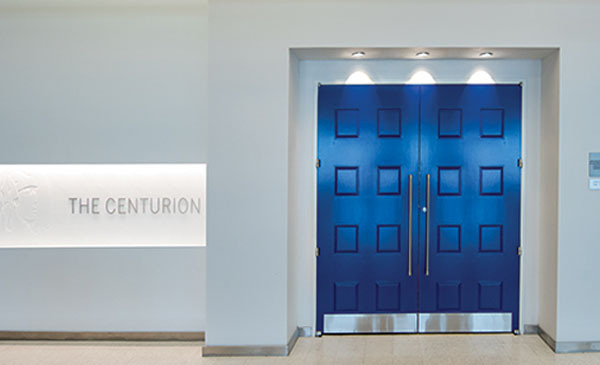 The Centurion Lounges are truly a notch above most domestic U.S. lounges, which reflects their association with a premium card issuer like American Express. Corporate travelers can partake of a gourmet taco bar for breakfast and lunch at the 9,000-square-foot location in Dallas/Fort Worth as well as other rotating menu choices imagined by Chef Dean Fearing. Relax on one of the lounge chairs, catch up on work with the complimentary WiFi, or reserve the complimentary meeting room. 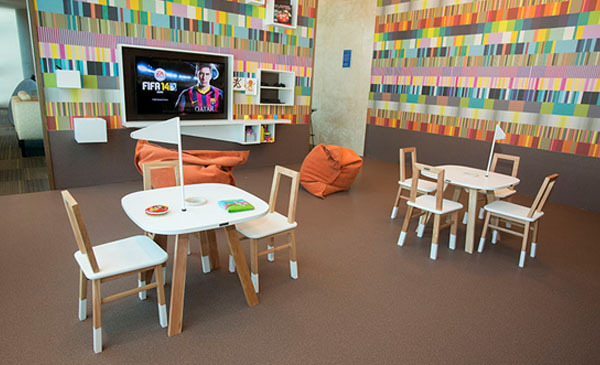 A children’s room with video games and other toys is also available. A fifth lounge has been proposed for Miami International Airport, but is still trying to gain appropriate approvals. Many of the same amenities are available at the original location in Las Vegas, with a separate menu by Chef Scott Conant. An early breakfast of brioche French toast with gianduja whipped cream may not cure your hangover, but it will be a sweet end to a weekend of partying before the trip home. 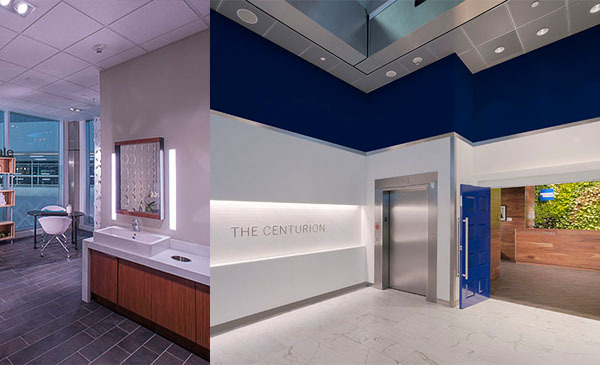 Both Centurion Lounges also have shower suites if you need to refresh between connecting flights or if you just spent a day in the summer heat. What we like about the Centurion Lounges is that all of these benefits are included in the entry fee, which is waived for Platinum and Centurion Cardholders. (Other American Express Cardholders must pay $50 per person.) Yes, that means even treatments at the Exhale Spa in Dallas/Fort Worth, providing chair massages, skin treatments, and manicures – all performed by excellent professionals. 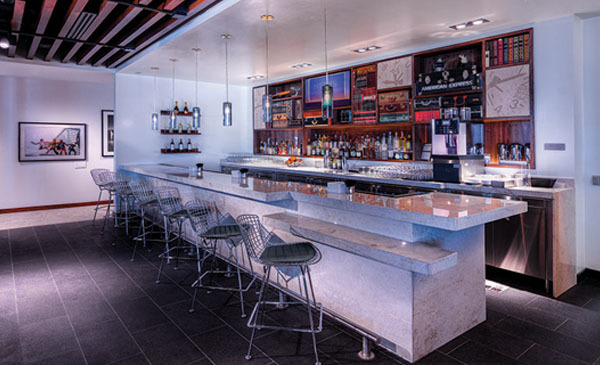 No lounge visit would be complete without a drink, so each location also has its own menu of specialty cocktails designed by mixologist Jim Meehan. At Dallas-Fort Worth these include treats like Texas Toast (a mix of sparkling wine, Blancones True Blue whiskey, Palo Cortado sherry, maple syrup, and toasted pecan bitters) or Tex/Mex (Tito’s Vodka, Cabeza Blanco tequila, corn, honey, lime, and jalapeno). You’re more likely to find classic cocktails like the Paloma and Vestper in Las Vegas, which would surely make the Rat Pack proud. 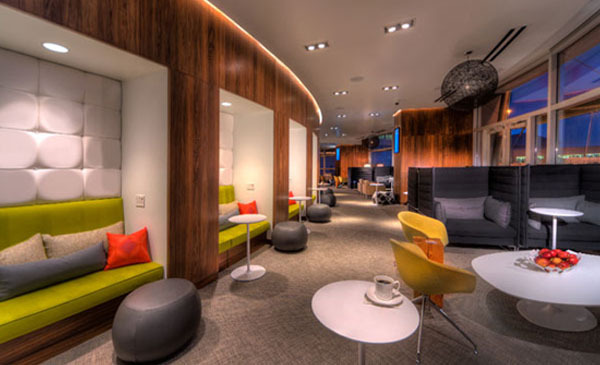 American Express has also operated international lounges for several years. These include the Centurion Clubs at international airports located in Mexico City (MEX), Buenos Aires (EZE), and Sao Paulo (GRU) as well as the Platinum Lounges in Mumbai (BOM) and Delhi (DEL). 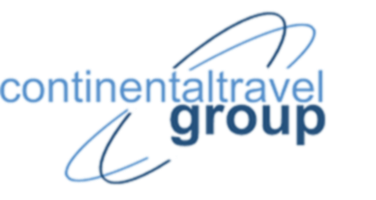 Simply present your Platinum Card and a ticket for same-day travel along with a photo ID. Cardholders are permitted to bring two adult companions, or a spouse and two children, to the Centurion Clubs, while access to the Platinum Lounges is limited to one companion. Additional guests may be permitted for a fee. The Centurion Club at Buenos Aires was recently expanded to 8,600 square feet (800 square meters) and is open 24 hours every day. Guests have access to a wide range of benefits include an upgraded buffet; beer, wine, and cocktails; semi-private workspaces; and a family room. Seating is available for 149 guests and include several distinct formats that allow close conversation or more open mingling. Computer stations let guests check their email or upcoming flight information if they don’t have personal computers with them. Or, entertain yourself watching one of the large screen televisions. 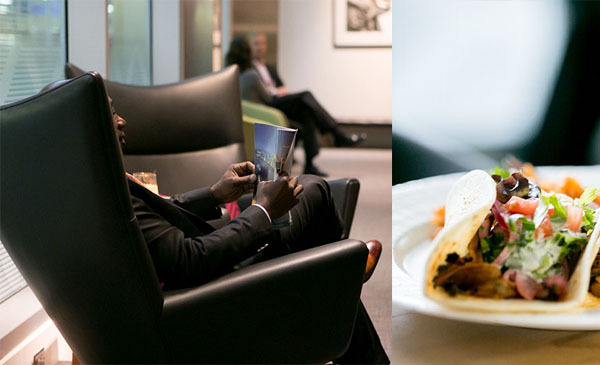 Although these international locations may not have all amenities of the Centurion Lounges in the United States — e.g., some provide freshly prepared hot food, but at an additional charge — they remain a valuable alternative for travelers and corporate travelers alike who lack access to traditional airline lounges, which may be restricted to passengers in premium cabins or with elite status. The next time you’re at the airport, be sure to check if one of these American Express lounges is located near you. Download the Loungebuddy mobile app for iOS or Android to stay informed with pictures, amenities, access rules, and new locations as they’re announced. Centurion Lounges in the United States are complimentary for those with the Platinum Charge Card or Centurion Card from American Express. Cardholders may bring two guests or a spouse and two children. Guests with any other American Express card may enter for a $50 fee. Centurion Clubs in Latin America are complimentary for those with the Platinum Charge Card or Centurion Card from American Express. Complimentary access for other American Express cardholders may be available at some locations. Cardholders may bring two guests or a spouse and two children. Platinum Lounges in India are complimentary for those with the Platinum Charge Card or Centurion Card from American Express. Cardholders may bring one guest. Side note for our client travelers based in Miami: It’s been rumored for a while that American Express was going to be going a new Centurion Lounge in Miami International Airport, however they were seeking approval from the Miami-Dade County board. It was announced recently that the Mayor of Miami approved the plan, and Amex will be opening the lounge towards the end of this year. After American Airlines cut the American Express Platinum access to their Admirals clubs the year, this is a welcome addition to Miami, especially for American flyers (Delta flyers with Amex Platinum cards can still access the SkyClub, but only when traveling on Delta). Amex card members can purchase a $50 one-day pass, however Platinum and Centurion card members have complimentary access with 2 guests or immediate family members, spouse/domestic partner and children under 18. This will be the fifth Centurion Lounge, joining the other locations in Las Vegas and Dallas-Ft. Worth, and the two currently under construction at LaGuardia and San Francisco. The Miami location will be taking over the former British Airways lounge in the North Terminal, which has sat vacant since 2007. Will be approximately 8,000 square foot Centurion Lounge at Miami International Airport. Located in the North Terminal, the Lounge will feature locally-inspired cuisine and cocktails from award-winning talent, a spa with complimentary treatments and a family room. Additionally, Card Members will enjoy access to high-speed Wi-Fi, personal computers and noise-buffering workspaces. More details on the culinary team and specific menu offerings will be available closer to the opening of the Lounge. According to the paperwork filed with Miami-Dade County, the Centurion lounge will feature signature elements such as a ‘living wall’ of plants, high end furniture, plush built-in nooks, noise-buffering private workstations, a communal library table and conversational areas for guests to relax, order beverages or be served complimentary signature ‘bites.’ American Express partners with renowned local chefs to develop upscale regional cuisine and has already identified a James Beard award winner in Miami who focuses on locally sourced ingredients and a Latin fusion menu. As an AA flyer who has an Executive AAdvantage card and thus access to the Admirals Club, I’m definitely excited to be able to use the Centurion lounge instead, though it may take a while to get to AA gates, but I guess a healthy walk after indulging in good food and drink isn’t the worst thing!